You load your belongings on your schedule! 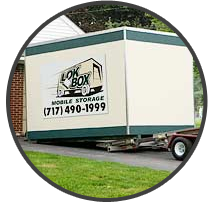 LokBox Mobile Storage is an on-site portable storage and moving service. We offer a secure and accessible alternative to the conventional self-storage facility by delivering a spacious, weatherproof storage container directly to your home, business, job-site or event. The storage container is conveniently located on your property allowing you 24/7 access. Our mobile storage units are available in two sizes: 8'x12' or 8'x16'. Mobile storage in Pennsylvania and beyond has never been easier!